See Hollywood Game Night Week 2: Valerie Bertinelli, Yvette Nicole Brown, Sarah Chalke, Cheryl Hines, Matthew Morrison, and Rob Riggle. Topper image credit: Trae Patton/NBC. Hollywood Game Night is inoffensive fun. Are emcee Jane Lynch and friends treated as gods who’ll overpower the show from the mere mortal contestants? Not quite. HGN is light-hearted compared to the spectacle of someone taking home $50,000 under pressure of going home broke on The Winner Is. The party atmosphere is easily established with decor, the bar, and the live band. Aside from references to alcohol, HGN could easily fit as a syndicated daily show. The $25,000 grand prize seemed less impressive after watching The Winner Is, but I was fine with it after watching the first episode in full. Much credit goes to the Rayburn-esque Lynch for being engaging and keeping control. Martin Short is there for the “lulz,” but some of the actions could’ve been costly in a close game. I can recognize the celebrities featured. They’re a rank above has-beens, never-weres, and just-happy-to-be-heres that could easily populate a celeb roster. Alyson Hannigan – Someone who I’ve mentioned before. Game 1: Crunch Time – Each player faces off against their opposing side. They see a picture of a snack in a bowl and whoever buzzes in must guess the snack. Plenty premium product placement by Frito-Lay? Game 2: Take the Hint – Celebs each give a one-word clue to the captain. A variation of Password. 90 seconds may be too long, though. Amy struggles getting only one right. Kevin easily guess the first two words to win. Final score: 8-1 in favor of Kevin’s team. Score after two rounds: Kevin’s ahead 11-4. Game 3: Li’l Picassos – Guess the portrait drawn by little kids. Each portrait do feature a trademark of the star. (Angelina Jolie’s leg, Simon Cowell’s Coke glass) There’s also a nifty touch where handlers unveil the fine art with white gloves. Score: Kevin still leads 21-11. Watch this clip of the Li’l Picassos round from Hollywood Game Night. Game 4: Timeline – Place the images in the correct order. Each correct placement is worth two points with a five point bonus for getting all six images correct. 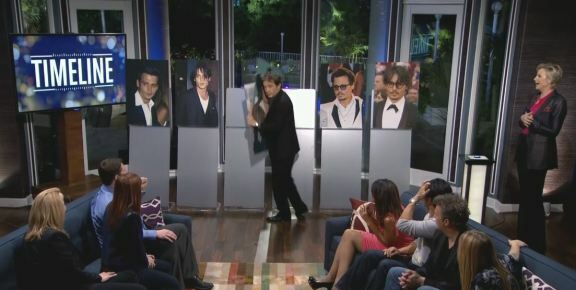 Kevin’s team selects Martin Short to place images of Johnny Depp in chronological order. Unfortunately, a game where real money is at stake for civilian contestants is not the optimal platform for Short’s high-LARIOUS brand of comedy. Daniel Dae-Kim from Amy’s team puts together images of Brad Pitt in chronological order. Daniel gets them all correct for an additional five point bonus. That’s just what Amy needed to close the gap as Kevin’s team is only ahead 29-28. Game 5: I Love a Charade – For a given category, each team acts out the subject that fits in that category. Correct guesses are worth five points. Kevin’s team acts out Tom Hanks movie titles (11 correct). Amy’s team does titles from Tom Cruise movies (9 correct). Final score: Kevin’s defeats Amy’s 84-73. Her consolation prize: a trip to the bar. Bonus round: Celebrity Name Game – Alyson gives clues to celebrities. Kevin gets 10 celebrities right and he gets $25,000 and Alyson gets $10,000 to her charity, Save the Children. The 90 second time limit seems generous, but Alyson passed several times. Kevin had 7 celebrities right and takes home $7,000. Alyson gets $7,000 for her charity.